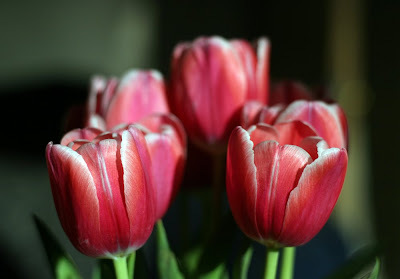 Tulips, originally uploaded by spoonergregory. The Easter weekend has been cold, wet and snowy so we have stayed inside and worked on some new prints. I have been working on a small multi-layered landscape print, which requires lots of slow, steady cutting and careful planning. I'm very pleased with how it is shaping up, and Jon thinks that its one of my best so far... Watch this space for the finished print! 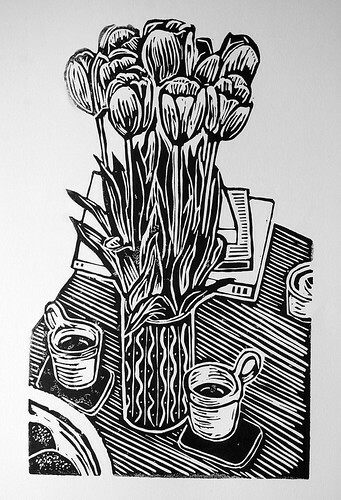 The tulips print is now available from our Etsy shop! Woodman's Whippet Ale, originally uploaded by deaconswood. Goodness, it's been over a month since our last post - how remiss of us! In our last post we mentioned a little surprise letterpress project we were working on - here are the results! We printed a set of beer bottle labels for our brother-in-law, James, for his birthday. 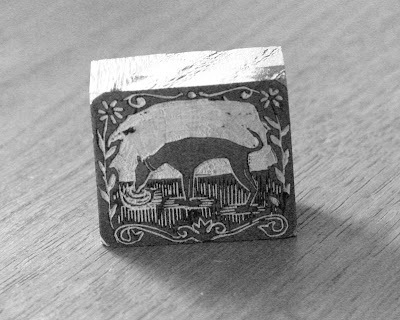 Jon did a small wood engraving of a whippet for the central image, and we used Plantin 24pt for the text. 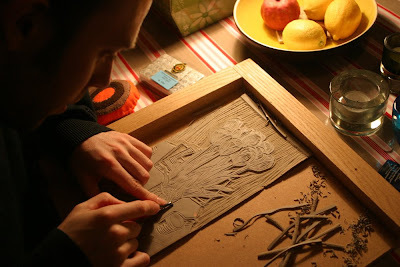 Here is the block (a 4x5cm maple block) and the type set up in the chase ready for printing. We are both working on ideas for two large landscape relief prints at the moment, but its slow progress as this is such a busy time of year for us - we will post more details soon!